What are you doing as you read this? Are you sitting or standing? Before the previous question, were you paying attention to what your body was doing? Now think about your posture as you read. Did you just straighten up? Paying attention to your posture is a new way to think about fitness. The POINT 52 Posture System uses brain science to wire your brain to your body through your posture. What do most people want? They want simple and easy and posture is as simple and easy as it gets. It's even easier to understand posture's power when looking at a single week. Wow! 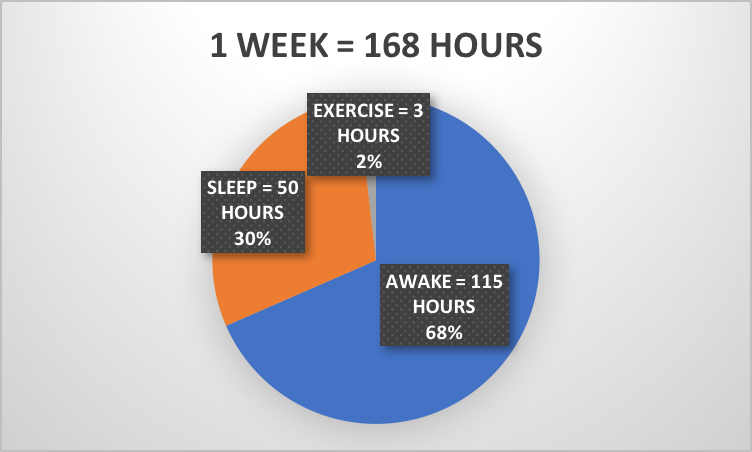 Those 115 hours a week clearly reveal a gap in the way we think about fitness. Posture perfectly fills the gap because when using your posture correctly, everything you do becomes exercise. Isn't that fantastic? 115 hours of exercise a week using posture. To get started, call us at 210-825-0924. Click here for directions to our convenient location. Before knowing the POINT 52 Posture System, my 12 hour emergency room shifts were difficult. Now my shifts are much easier to handle because I know how to work with my body."